The second chapter "Intellectuals" by Paul Johnson is about Percy Shelley. Most of us know the romantic poet and political dreamer as the gentlest of souls, wishing nothing but love and peace to all. 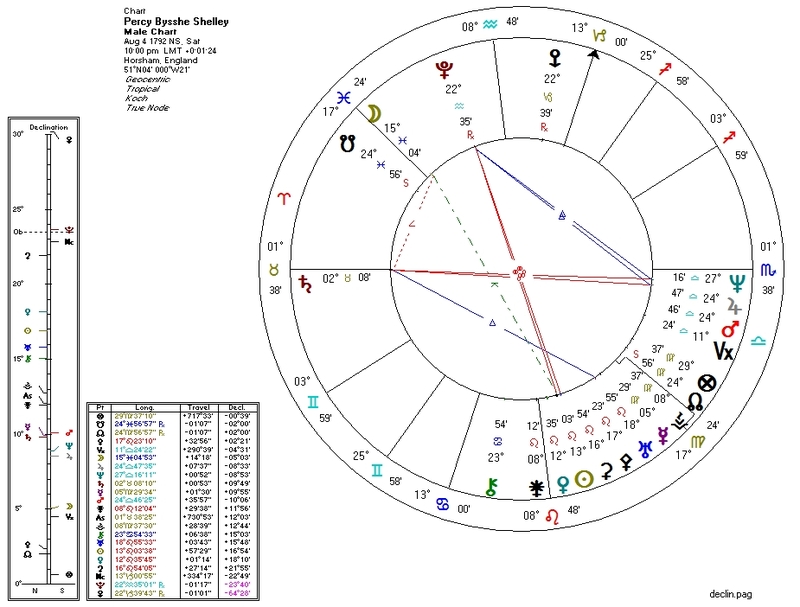 I was therefore surprised a few years ago when I analyzed Shelley's chart, finding it to be much less "ethical" than mainstream history would portray him. Johnson's book solved the puzzle for me. It reveals that Shelley was, in reality, a human wrecking ball who spewed hatred and discord to everyone unfortunate enough to love him even as he radiated peace and goodwill to his audience. Apollonian: Pallas ruled by and conjunct Sun. This puts Shelley in the "Statist"quadrant of "the Axis of Good and Evil". Usually this results in the native espousing a philosophy of authoritarian government and usually war. In this case Shelley seems to have compartmentalized his ethics, reserving peace and wisdom for the public and unleashing war in his private life. Collectivist: Venus quintile Neptune (via Jupiter). Shelley remarked, like a true Leftist, that private property should be abolished. In his personal life he acknowledged no private property but his own, ruthlessly cheating and extorting friends, family, and creditors. Liberal: Moon conjunct South Node, ruled by Neptune. 2. Venus quintile Neptune (via Jupiter). 4. Pluto trine both co-rulers of Moon. Statist + Collectivist + Cultural Liberal + Bloodbath Formula --> hard authoritarian leftist. Had Shelley not lived in the immediate aftermath of the French Revolution, I think he would have been a supporter of "public-minded" authoritarianism a la Rousseau. Had he been born after Marx, I think he would have been a Marxist. Stationary South Node in Pisces in the Twelfth House: extreme mystical/spiritual/artistic inclinations in youth. Neptune/Jupiter/Mars at Descendant opposite Saturn rising: reflects both his ability to work to give solid form to dreams and ideals, and also his tendency to first hyper-idealize and then eventually attack his friends and lovers. Fifth House concentration: strong emphasis on self-expression, creativity, and romance. Chiron in Cancer in the Fourth House: permanently wounded family relations. Sun/Venus/Pallas/Uranus stellium: a rebellious bringer of beauty who (publicly) personified an ethic. Venus/Pallas often represents charisma and may explain what must have been considerable charm. Pallas parallel North Node: had Shelley grown to be older, I suspect he would have gradually realized the error of his ways become a more ethical person. Perhaps this configuration reflects also the fact that long after his death, he is remembered as a sort of ethical paragon and not as he actually was in life.